Andy from Hunters Moor is a huge Leicester City fan. 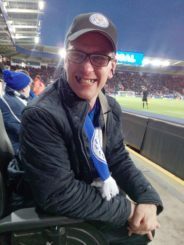 He attended a Match against Cardiff at Leicester’s home ground on 12th January 2019. He was assisted by Gavin Dale our driver and a Rehabilitation Assistant to enjoy this trip. A massive thank you to everyone who helped make this happen, Andy hasn’t been to a football game since his injury in 2015! Hopefully this will be the first of many games he can attend.